Beautiful Voices is our ongoing blog series that highlights inspiring, empowering women. Our most recent Beautiful Voice is Priscilla Cobb. See what she says when Annmarie asks her some questions about her own personal beauty. Priscilla Cobb grew up in Chattanooga, TN and went to Middle Tennessee State to start her nursing career at age 20. She went back to school two more times at the University of Tennessee Center for Health Care Sciences and then the University of Alabama at Birmingham to earn her BSN and MSN. Priscilla worked as a Pediatric Nurse Practitioner, then she transferred to management after receiving her Masters degree. She was the Director of Nursing in various hospitals and also a VP for Nursing. In 2006, she acquired her own business in alternative health and helps people cleanse and change their eating. Priscilla has one daughter, who is 33 years old and the joy of her life. Priscilla lives in a suburb of Atlanta, GA called Roswell, loves to ballroom dance and hike, and has 2 kitties who shower her with affection and appreciation. 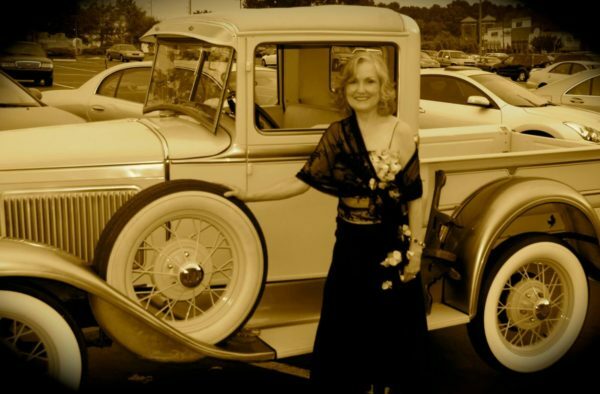 She is pictured here at a “Great Gatsby” party. There were two events that shaped me into who I am today. The first was a 20-year ongoing process that began with the birth of my daughter. First, it was the experience of unconditional love and the power of it that humbled me and brought more joy than I knew was possible. Then, as she grew and her needs changed and my life changed, I learned how important it was to consider her needs along with mine and how to juggle them to meet both, but still convey to her my total and unconditional love. When she had a crisis in her teen years, I learned about tough love and how to respond with unconditional love, but also allow consequences when necessary. Amidst all that learning, I was also called upon to learn how to support my sister who was 14 months older than me in her battle with breast cancer and how to support her as she took her journey to cross over. It was a profoundly painful yet beautiful experience as we shared her last three days together. And it was a career-changing event, as she was not saved by the medical model that I had invested so many years learning and practicing. I am a Registered Nurse, and was a Pediatric Nurse Practitioner for a while, then migrated to a Masters degree in Nursing Administration and a change to the management side. I was a Director of Nursing in the Pediatric and Obstetric fields for many years. When my sister died, I began searching for the reason the medicine did not work. I delved into alternative types of thinking about health as well as spiritual modalities. I studied and continued my nursing career for another 14 years after she died. I began to incorporate diet changes and alternative modalities in my own health care and experienced much healing, and recovered vitality that I did not know I had lost. When the opportunity to purchase a wellness clinic arose in 2006, I accepted the challenge and have learned so much more since then. I now adore what I do with folks one-on-one and feel I have answered my calling in life. If money were no object, what would you be doing? Would it be exactly what you are already doing? If money were no object, I would do what I do today, but would have a larger enterprise with a totally chemical free wellness “spa” that would offer many different services. I would also be heavily involved in charity for the causes I feel are important to people and the planet, such as the providing clean water to people who do not have access, supporting environmentally responsible organic farming, supporting the cause of GMO labeling, and finding a way to help folks become more self sufficient. I feel most at peace when I am on a trail hike in nature. This has been true for me since I was a small child. My favorite beauty tip is to eat for beauty, especially the healthy fats and lots of vegetables. Annmarie's mission fits into my lifestyle by giving me a line of skin care that I can wholeheartedly endorse to those who value my recommendations. Her mission is my mission: to use only unadulterated substances on my body and support our planet with gentleness and understanding for the balance that nature offers.